Welcome! Global Arts & Antiques is your one stop shop to discover a great collection of Russian antiques for sale at competitive prices. We offer only authentic antique items, including works from Faberge and Feodor Ruckert. A Beautiful Antique Russian Silver 88 Jeweled And Cloisonne Shaded Enamel Large And Heavy Kovsh With Lapis Lazuli Beeck, Circa 1908-1917. Height Is 6 Inches. Length Is 9 Inches. Weight Is 529 Grams. 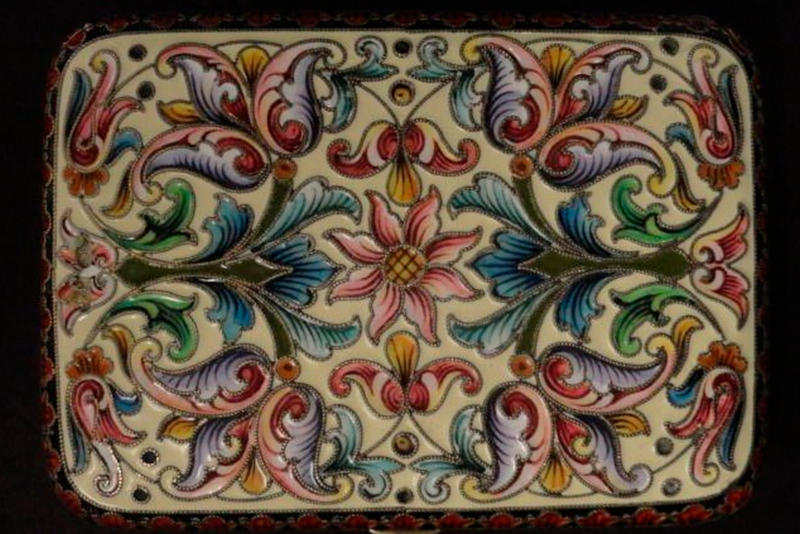 Antique Russian Silver Cloisonne And Pictorial Enamel Snuff Box By 11th Artel. Diameter Is 2.5 Inches. Weight Is 87 Grams. A Beautiful Antique Russian Silver Cloisonne Shaded Enamel Spoon With Plique-A-Jour Enamel Handle By Feodor Ruckert, Circa 1908-1917. Length Is 7.75 Inches. Set of Twelve Russian Gilded Silver And Shaded ENAMEL Teaspoons, Feodor Rucket. Russian gilded silver and shaded enamel creamer, Feodor Ruckert, Moscow, circa 1900. For price please inquire.